Recently my school district, Pendergast Elementary, held a color fun run that was open to everyone in the community. Participants were charged a small fee of $2.00 that included a t-shirt, entry into the run and a raffle ticket for prizes. The Garden Lakes Elementary Fuel up to Play 60 team was asked by the PTA to help by sponsoring a booth at the run. Our program advisor had a great idea to have an obstacle course that kids could run through and earn prizes. The Dairy Council of Arizona was kind enough to lend us their outdoor equipment to use for the obstacle course and also provided us with dairy inspired prizes. 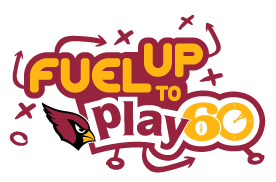 This was a great way to represent and promote the Fuel Up to Play 60 program to parents and kids. It also showed kids how easy and fun it is to get active and have fun outdoors. The kids were excited to participate, win prizes and show off their cow hats!